My name is Kevin Matthews and I would like to introduce my triplanar control "Balancing AFO" design. This is the design that I have started using in my practice for those patients I will be treating with a new approach to managing equinus diagnoses, also referred to as the new paradigm in managing equinus. I would like to start with an excerpt from an article in the O&P Business News, now Healio, entitled "Conclusions from the ISPO Consensus Conference continually updated." This was a group of international experts formed to find a consensus on managing the population afflicted with Cerebral Palsy. "Considering the use of AFOs, it was concluded that the AFOs that prevent plantarflexion can improve gait efficiency." Condie said. 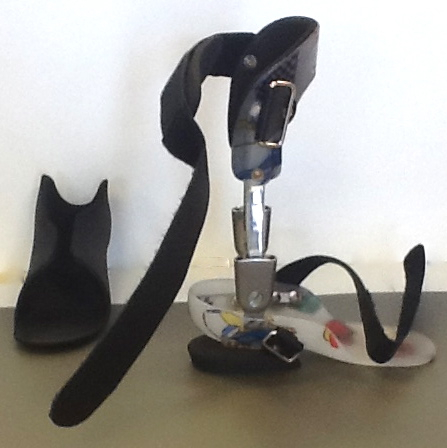 "Secondly, it has been demonstrated that AFOs have an indirect effect upon the kinetic and kinematics of both the knee and the hip joints and these effects may be optimized by tuning the orthosis." Click here for entire Consensus Report. The word in the article my design addresses is "tuning." I believe in comfortable, rigid, triplanar control. 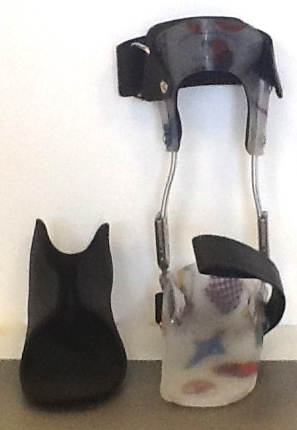 I believe this design addresses just about every aspect needed from the AFO. 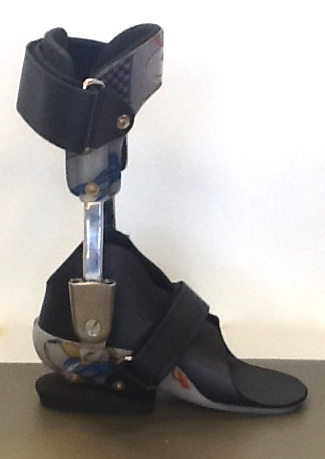 This design allows for easy post fabrication tuning of the AFO. In this new approach to managing this population, proper hip, knee, ankle, and foot are optimized, primarily accomplished with shoe modification. The ankle is typically set in some plantarflexion, which may be substantial initially. I believe most tuning is currently made by tedious footwear modifications. The AFOFC, or AFO Footwear Combination, has been studied and commented on fairly extensively by Elaine Owen and others. I feel that by using metal joints with dual channel adjustability, tuning is much easier. The angles can be easily tuned in minutes in balanced increments. The shoe may also be modified, but in smaller measure. I feel that internal heel lifts under the AFOs may be all that is necessary in many instances. My design uses microcell puff inner boots, a 35 durometer EVA. This total contact foam serves to distribute pressure for better control. When evaluating fit and function at follow up appointments, the wear pattern on the inner boot can also tell quite a story. Areas of contact and noncontact are easily discerned. The puff inner boot also allows for easier modification. Inspection of the inner boot wear pattern gives us clues as to efficacy. My design also utilizes a pretibial shell. The pretibial shell is a solid resting place for the lower extremity and I believe it has some impact on rotary forces of the tibia. 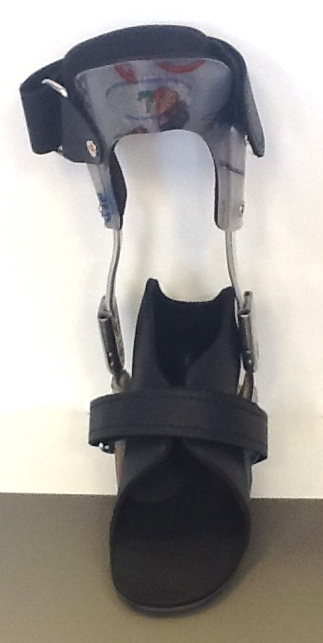 The pretibial shell is also trimmed higher than traditional AFOs, which gives you better leverage against the ankle. I feel that the posterior calf strap, when worn properly, may also limit contraction of the plantarflexors. This hybrid, plastic and metal, design is difficult to fabricate, but once you have a system for fabrication in place it is merely replicated. This design also pays much more than plastic only designs, as well it should. Before I mold the patient, I determine and notate the plantarflexion angle at first catch, AKA R-1. I mold the child in a position as close to R-1 as I can achieve without losing control of other angles. When obtaining the negative model, I try to place the child in the safest or most comfortable position for molding, typically in a parent's lap for the young ones. My goal in obtaining the negative model is to achieve the best triplaner alignment without significant regard to plantarflexion angle. I have found that the more I try to force the foot to a neutral dorsiflexion alignment, the more the rest of the model is compromised. I strive for optimal triplanar replication of the extremity, or best aligned model. It is quite easy to fix sagittal alignment on the bandsaw. If wedged properly, little is lost. Some recommend prone casting, but I feel it places the child in a vulnerable position with a stranger. I don't want to bring out any anxieties. Therapists have better results with this technique, I think because they tend to have a more established rapport with the child prior to casting. I modify the positive model for total contact and maximal control. 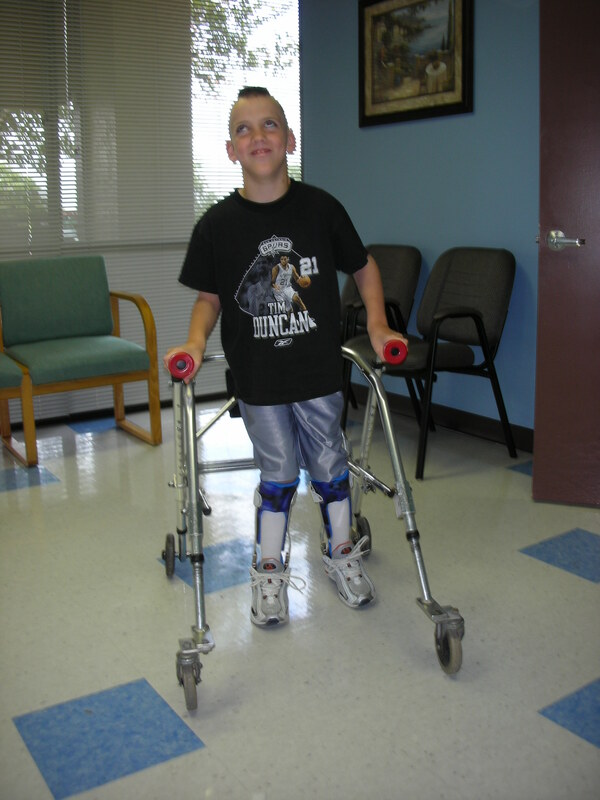 I feel movement inside the orthosis is contraindicated due to sheer and loss of control of motion. The inner boot really helps in making the control tolerable. In this approach alignment is optimized for standing balance and gait . This is an oversimplification of the paradigm, but basically describes what drives the effort. I believe this approach will catch on as more research reveals all of the benefits.